I’m sorry that you feel like your engagement photos are awkward or that you don’t look your best. I’m truly sorry if you feel that way about your wedding photos, too. My heart bleeds for you not only as the photographer who got to capture your beautiful smile but as a self-conscious woman. The thing is, I too, am self-conscious. Extremely. I don’t like to look at photos of myself and would much rather offer to capture someone else’s photos than to be in photos. When I look at photos of myself I see my flaws; the extra pounds that late-night pizza and poutine created, the bumps and lumps that even Spanx can’t handle. I see a nose that isn’t as defined as I’d like and a smile that seems too small for my face. When I look at photos of you, however, I don’t see any flaws. I see pure beauty. I see sparkling eyes, I see soft skin, I see amazing hair but most importantly – I see the bond between you and your partner. I see the love that you have for each other. I see how he holds you in his arms and how when he breathes in he’s remembering the smell of your perfume. I see how he chuckles when you kiss him and leave lipgloss on his lips and I see how he wouldn’t change it for the world. I see how truly loved you are and how loving you are to him. I see a bond that is so strong that I know you will carry out your wedding vows with every breath you take, each and every day of your lives. I see you next to someone who loves you unconditionally for who you are at this very moment in time. Feeling self-conscious is normal but it’s important to remember that despite what you see in a photo and despite how you criticize yourself based on that, others will look at that same photos and think that you are amazing. Learning how to reduce those feelings of self-consciousness can be difficult; trust me, I know. But I’d like to share with you what I’ve learned over the years and hopefully you can apply it to yourself. Understand that everyone is self-conscious about something; you are not alone! Understand that you may have critical people in your life who can’t keep their mouth shut and even if you were retouched to the moon and back would still have something negative to say. If someone says something negative about your appearance in a photo instead of feeling self-conscious about yourself, feel pitty for them. How sad and insecure they must be to have to build themselves up by pointing out others insecurities. What do they gain from it? Darn trouble makers – don’t let them get to you. Our friends at Psychology for Photographers have said it incredibly well “[Photography is] about making the intangibles of love, memory, happiness, and meaning into a tangible product.” The picture you’re looking at is about so much more than your physical self; there’s an immensely long story behind every single image and that is what matters most. While I still hate having my own photo taken, whenever I step in front of a camera I remember all of the above and I remember that I am loved by my husband, my friends and my family. I’m loved exactly as I am today; with bags under my eyes and an extra roll around my waist. If they love me for who I am, why can’t I treat myself to the same courtesy? 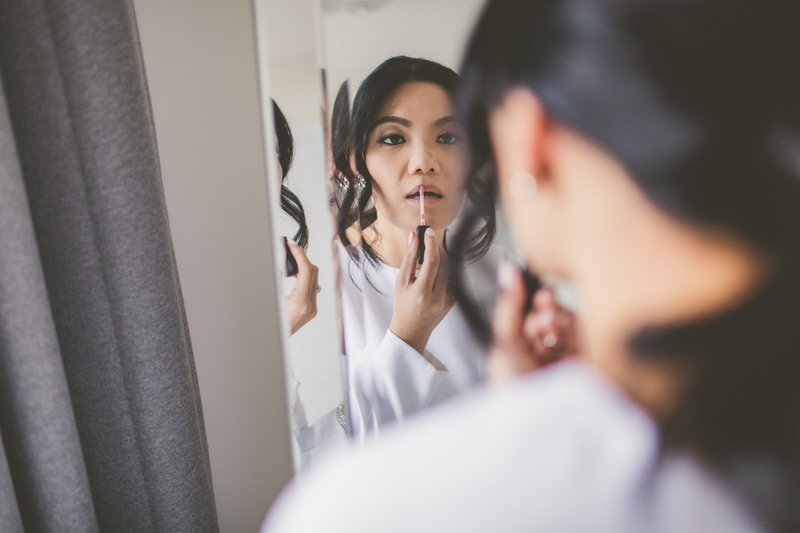 To my dear self-conscious bride who hates her photos, I hope that you can take what you’ve read here today and take baby steps towards loving yourself the way you are loved by all those around you. Your friendly Toronto wedding photographer. EDITOR’S NOTE: This article is not based on an actual event with a past client, rather created as an open letter to a self-conscious bride from a photographer who understands your concerns all too well.